Brevard is nestled in the heart of Transylvania County and the North Carolina mountains. Just a short 45-minute drive from Asheville, Brevard has something for everyone! 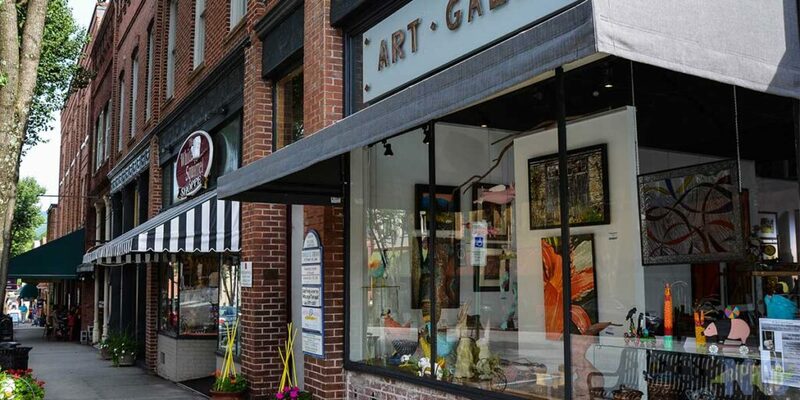 It’s home to a thriving art, outdoor, and adventure scene! With over 250 waterfalls, you’re bound to see some water. Walk, hike, bike, or even climb your way through Brevard and try to see if you can all that the area has to offer. Here are some fun weekend things to do in Brevard, though we definitely think you’ll want to stay for longer! 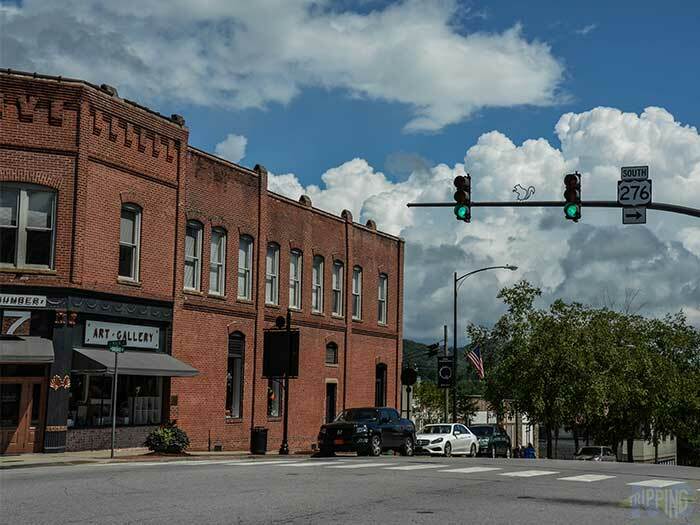 For info about getting to Brevard and more, check out our page dedicated to this awesome mountain town! If you’re looking for hotels in Brevard, Check here for the best pricing and availability on places to stay in the area! You can never go wrong with the Holiday Inn when choosing your Brevard hotel. 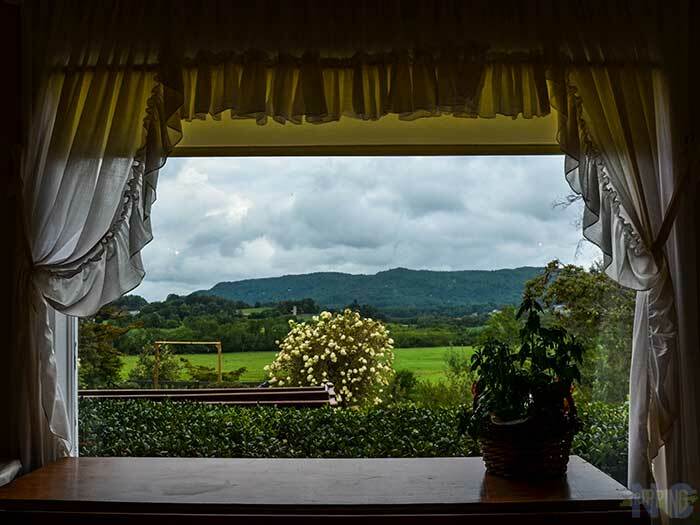 However, we think it’s best to soak up as much nature as possible and the best way to do that is by staying at a Bed and Breakfast, especially if the weather in Brevard isn’t cooperating. That way you can sit back and enjoy a nice view if you’re staying at the right place. Our jumping-off point for weekend things to do in Brevard is The Pines Country Inn. That place is great and not just for its magnificent views from the main house. They also offer an incredible breakfast. Honestly, the grits at The Pines are still the best we’ve ever had! The Pines Country Inn ranked among our favorite hotels in North Carolina. If you can’t get in there, check here for the best prices on Brevard NC hotels! What should you do first of all the weekend things to do in Brevard? Walk around Downtown. It’s fairly small and Highway 64 cuts right through, temporarily turning into Broad Street while doing so. It’s a cozy place for walking and there are plenty of fun places to visit. 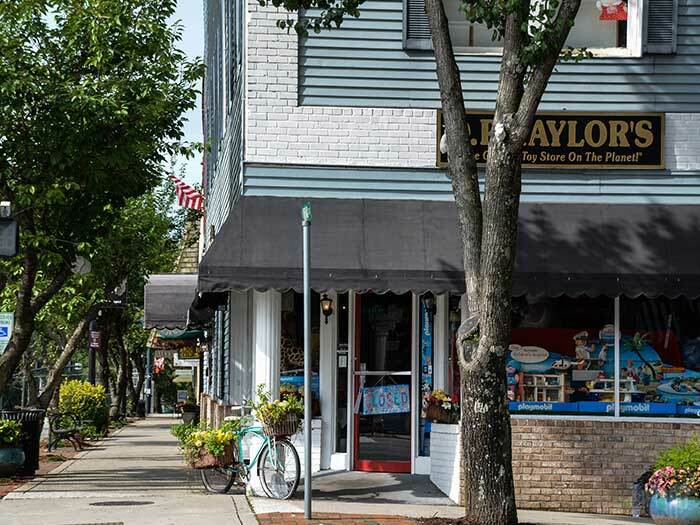 You’ll find a lot of kitschy little shops that compliment the town’s art scene and businesses. There’s also a steady year-round Brevard event calendar that can keep any visitor busy throughout the year. Many people come out for the July 4th and Halloweenfest Celebrations, but Memorial Day Weekend’s White Squirrel Festival is the best-known game in town. Rocky’s Grill and Soda Shop. 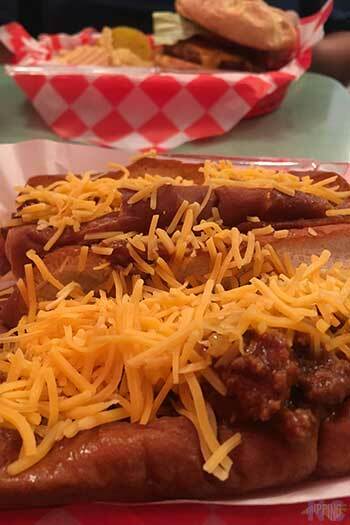 Brevard has a nice food scene and while walking around Downtown, you should stop by Rocky’s Grill & Soda Shop (above, left) for an old-fashioned milkshake, fountain cherry coke, and a hot dog! If you find yourself outside of the town and are craving some of that traditional western North Carolina barbecue, Hawg Wild has some incredible ribs and pulled pork! There are also some nice places to grab a drink or pint in town, including Brevard Brewing Company. Of course, you can’t leave Brevard without a brew from Oskar Blues Brewery! Enjoy a pint of their famed Dale’s Pale Ale or the lesser known Hotbox Coffee IPA. Sit under their large outdoor carport with a bucket of peanuts and make friends around you! 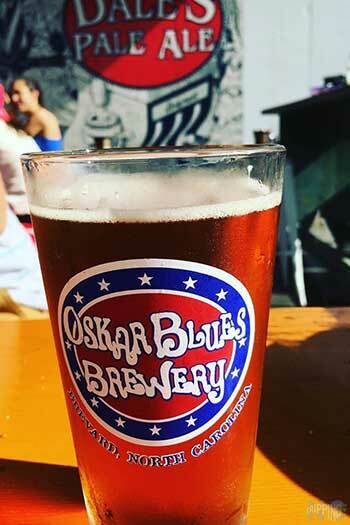 Sure, you had to know we’d include Oskar Blues in our weekend things to do in Brevard but we also mentioned it in our guide to North Carolina breweries. 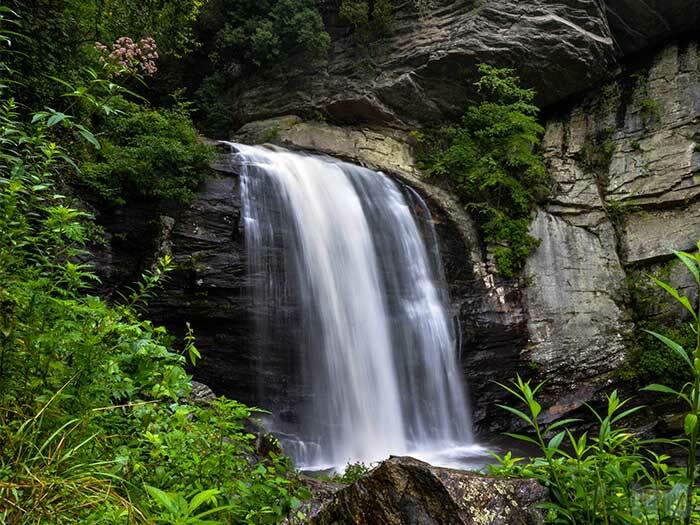 Brevard is known as the “Land of Waterfalls,” so naturally, chasing them is the top weekend thing to do in Brevard when it’s nice! 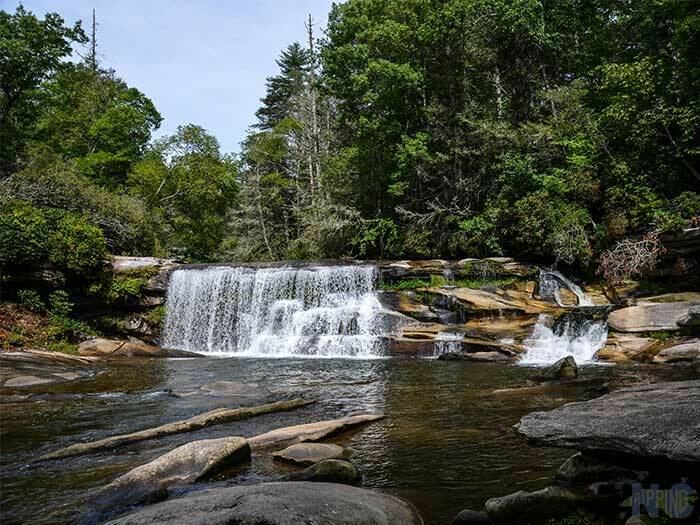 Many are found within Pisgah National Forest, though you can find more at nearby Nantahala National Forest and Dupont State Forest. Sliding Rock is a natural waterslide that attracts many tourists! Grab your swimsuit and $3 for admission and slide your heart away! While Sliding Rock is the most popular destination, there are plenty of hidden gems to get you out from all the crowds. 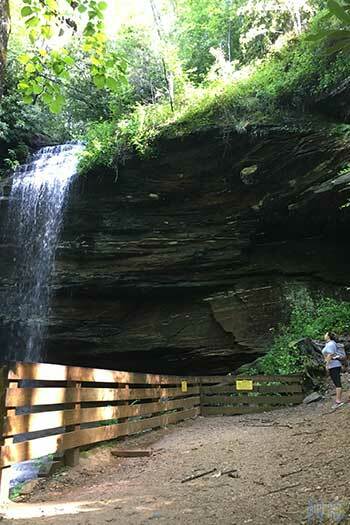 Some waterfalls like Looking Glass Falls are accessible right off the road. Others like Moore Cove (below, right) require a bit of a hike. Either way, it’s worth the journey to marvel at the gushing water! Getting to Moore Cove Falls is one of the best ways to enjoy fall hiking in North Carolina, too! If you have some extra time and want to see the most epic waterfall around- head south to Upper Whitewater Falls (above, left). It claims to be the tallest waterfall east of the Mississippi River, though there seems to be some controversy surrounding that. Another great waterfall to catch on your way out of town to the Blue Ridge Parkway is French Broad and Bird Rock Falls. These falls are technically on private property, but the community of Living Waters Ministry allows people to access the falls. Park on the side of the road and just remember to be respectful of the environment as you marvel at the epic view! We covered these must-see waterfalls in more detail here. 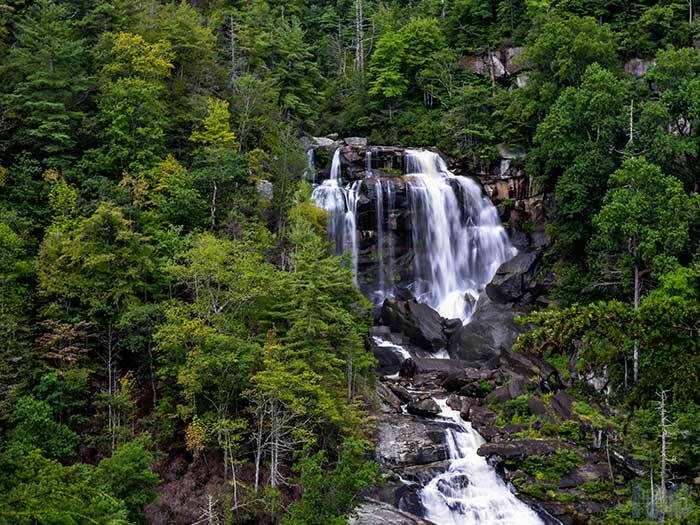 Also, we included the Brevard area’s waterfalls in our roundup of Unique Things to Do in North Carolina. 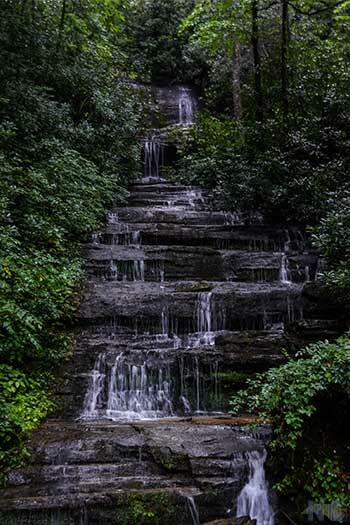 If you want to get outside not specifically to see waterfalls, Silvermont Park surrounds the beautiful Silvermont Mansion and is a nice way to spend a morning or afternoon. For cycling in Brevard, many folks come for the Parkway Loop, and there’s all the route that runs from Downtown to Pisgah Visitors Center. There are also opportunities for horse riding if that’s what you’d like to do when visiting. Golfers will look to Connestee Falls Golf Club first, as it’s a pretty highly regarded place to tee off. I hope you can visit this wonderful spot in western North Carolina. If you have, what did you think of it? If not, where would you start your Brevard weekend? Regardless of whether you’ve been or planning to visit Brevard, we’d love to read your thoughts in the comments section below! This article was originally created on December 1, 2017. It has been maintained and updated (as of February 15, 2019) to reflect current viewpoints and North Carolina travel trends. This entry was posted in Travel and tagged Brevard, The Mountains, Transylvania County.